25025 stands at Polmadie on April 3rd 1977, it will be withdrawn in less than two weeks. 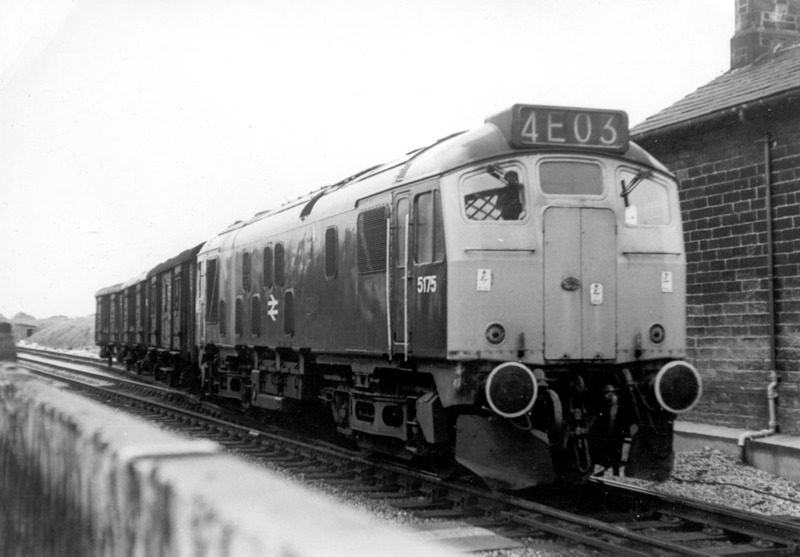 The fifteen year career of D5175/25025 was split between allocations to Eastern Region & Scottish Region, with the former taking the greater part of the time. Fuel tanks later fitted with circular gauges (both sides). Time between withdrawal and scrapping: 14 months. October 1966 to Holbeck (55A). October 1972 to Tinsley (41A). 25025 was the 16th Class 25 withdrawn, the only one retired during April 1977. After withdrawal fire damaged 25025 was stored at Polmadie from September 1976 until moved to Glasgow Works during February 1978 and scrapped there during June 1978. Noted Derby Works April 1965. Noted Derby Works September & October 1969 (repaint to blue/yellow). Assumed Crewe Works early 1973. Noted Glasgow Works sometime in 1976?? During September 5175 entered Derby Locomotive Works for an overhaul. Prior to entering the Works it still retained green livery with full yellow ends. The fuel tank was without circular gauges, there were blanking plates over the boiler room grilles and the gangway doors were still in place. The buffer beam steam pipe connections were still present. Miniature snowploughs were also fitted. After outshopping from Derby the locomotive was in blue & yellow livery, the gangway doors had been retained and the fuel tank was fitted with a circular gauge. The recorded passenger workings for D5175/25025 are few, the first so noted took place on August 8th 1970 with 5175 working the 09.10 Bradford - Poole from Bradford to Nottingham. On December 15th 5175 worked a Healey Mills - Birkenhead freight. Photograph collection of webmaster. Seen here at Longridge, date unknown 5175/25025 spent most of its working life attached to Eastern Region depots. Two trips to Skegness have been recorded. Firstly a Leicester - Skegness roundtrip took place on June 15th 1974 with 25025 & 25074. Secondly on June 21st 1975 working a roundtrip Sheffield - Skegness. 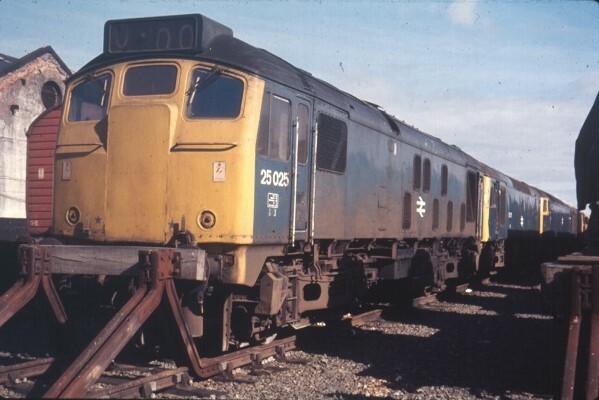 After almost fourteen years allocated to Eastern Region depots, 25025 was transferred to Eastfield during February 1976, a move designed to hasten the end of the Scottish Class 24s. Sometime during 1976 25025 visited Glasgow Works for repair. The most significant change was the sheeting over of the gangway doors. On a chilly September 8th 1976 the early morning Stranraer Harbour - Glasgow Central diesel multiple unit (51030, 59406 and 51015) failed before departure. 25025 was on hand to take the service as far as Ayr, where the Class 25 was removed and sent to the depot. 25025 was withdrawn on April 15th 1977. Page added August 6th 2013. Last updated March 14th 2019.